The NHS Weight Loss Plan is a comprehensive, medically accurate plan which helps you to lose excess weight and maintain a healthy lifestyle. It recommends foods and exercises using a 12 week program which is suitable for all kinds of people. You can also download free food and activity charts to help record your data. The National Health Service is a UK service which provides free health care to people in the United Kingdom. It is run by professional health carers, including doctors, nurses, dieticians and more. Consequently, the information and recommendations are researched and tested extensively, which gives some reassurance as to its reliability. This is a fairly low-tech method, with the website mainly providing a resource for finding information and tips. However, there are a few noteworthy online features worth looking into. For example, there are community chat rooms for people to exchange their thoughts and feelings. Generally there was a very friendly atmosphere, with people helping each other out when they felt low, saying thank you for support, recommending recipes and exercises, and more. It’s a good place to visit if you want a little support or a few more ideas outside of the prescribed schedule. The schedule itself lasts for 12 weeks and comes with food charts and activity charts. You can also access a range of free apps to help you out, including calorie counters and apps to find healthy recipes. These are particularly useful when you’re eating out or are looking for healthy options in the supermarkets. Aside from these features, however, most of the work is done by you, and you’ll need to keep your own records as they’re not stored on the site. Consequently, there’s little in the way of analytic tools or personalised programs. However, if you’re in the UK then you can visit a health care specialist to discuss your weight and ask for advice specific to you. This may be particularly important if you have a health concern. 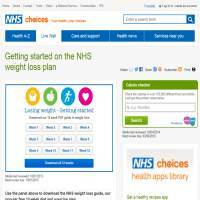 The NHS weight loss guide might not be as flashy as some of its counterparts, but it has the basic premises right. There’s a basic but supportive online community to back up the various exercises and diet information, plus a few more freebies to help sweeten the deal. It won’t offer everything to everyone, but if you’re strapped for cash (and motivated to lose weight) this site offers the basics you’ll need to succeed.